Owning a landed property in Singapore is probably a dream of all home owners and based on recent research and analysis, it seems that once a house (which is located in a desirable precinct) is being put up for sale in the market, it took only a short period for it to be sold. According to property experts, it was mentioned that landed properties still hold better value as compared to other residential property types, and owners are likely to see a steady price appreciation in the long run. Also noted that in this particular segment of Singapore’s property market, many buyers of landed properties are for own stay. And due to that, the interest stays high as these owners can redevelop the current house on-site and build another brand new house with more space (subject to approval from authorities). Such “flexibility” is surely not possible for strata developments such as condominiums or apartments. Based on the current property market situation, where prices are rather volatile, more sellers are incurring losses and it has spurred buying demand for value deals. 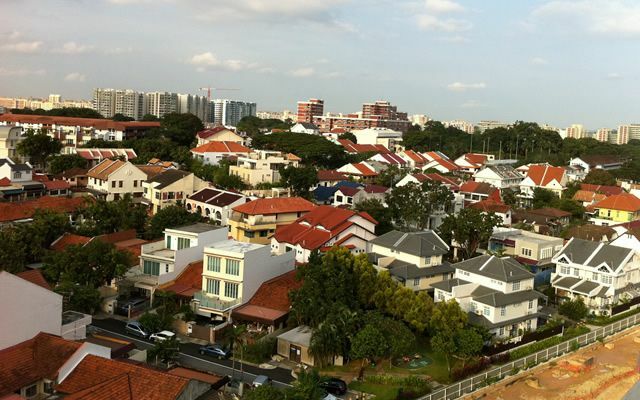 Singapore property buyers are taking this opportunity to upgrade to a landed property in the suburbs instead of shifting to another Singapore condo in a more upscale location, due to the narrowing price gap of properties in these 2 segments of the market. For instance, recently, a freehold terraced house located at Grace Walk, around the Lorong Chuan precinct, was snapped up for S$2.77 million or S1,021 per square foot (psf), despite being already 30 years old (constructed in 1985). On the other hand, a brand new 2-bedroom unit (1,044-sqft) at Leedon Residence (freehold condo in District 10) was recently transacted at S$2.54 million or S$2,433 psf. Thus at S$2.54 million, although the freehold condo unit at Leedon Residence in the upscale District 10 is priced lesser than the terraced house at Grace Walk (sitting on a 2,713-sqft plot) in the suburb District 19, but nothing still beats owning a piece of freehold plot of land which you have options to build a house of your dreams.